I have made fire! No, not really. But I have figured out how to make a loaf of bread that looks deceptively simple on the outside, but once you slice it there is a treasure of cinnamon and cream cheese sweet ooze in the center. Cinnamon roll bread! With the frosting in the middle. Need I say more? Even better yet, it is much simpler to make than actual cinnamon rolls (hence my desire to make it). 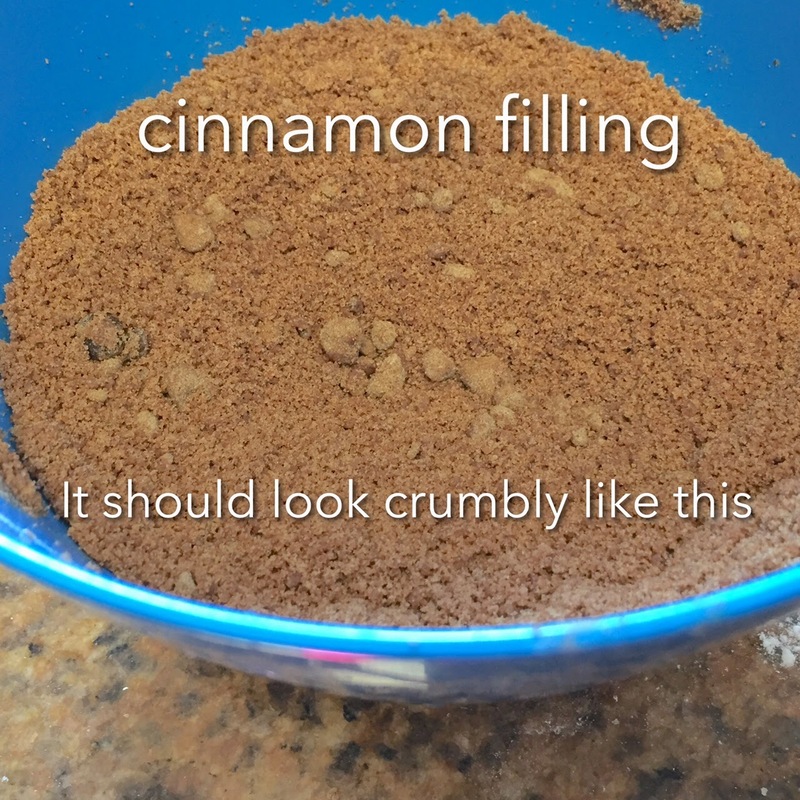 Cinnamon roll texture and flavor that is easy to make? Yes, please! (to see my first fail at making this bread see here). It is slightly less sweet and rich than eating a large cinnamon roll loaded with cream cheese frosting on top, but the taste is the same. And the bread itself is dense, sweet, and delicious. It can stand up to the cinnamony goo rolled in the center, and you get bits of cream cheesy-goodness in each bite. 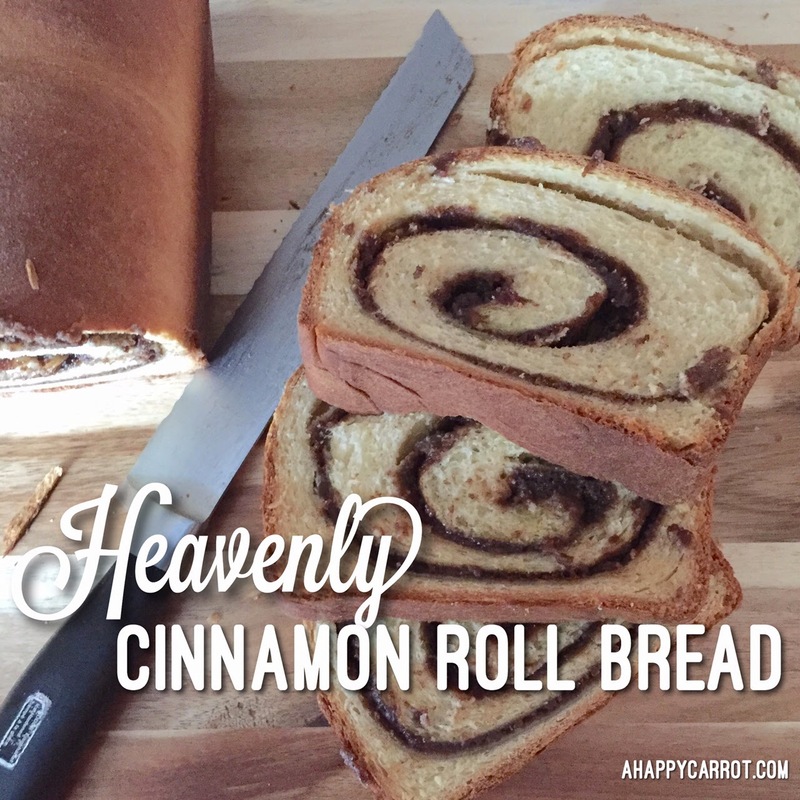 It has the perfect ratio of cinnamon and cream cheese to the bread, so you don't feel sick after eating it (like you sometimes do after eating a cinnamon roll loaded with yummy frosting). What? Me getting sick of too much sugar?! Yes, it rarely happens, but it can. The key to the dough is making sure you don't add too much flour when kneading so that it doesn't dry out and become tough. And then kneading it long enough to form a satiny-smooth looking dough. You can tell if your yeast is tooting when it gets frothy and forms a foam. Yay! Now it's proofed and activated, and you can move on to adding the other ingredients. I will give directions for both ways (instant and active dry yeast) in this recipe although I highly recommend getting instant yeast. I value those ten minutes it saves me. It somehow makes the thought of making bread less daunting. I find mine in the bulk section of my grocery store. Once it is kneaded long enough (about 5 minutes by mixer on a low/medium speed--I use speed 2 on my kitchen-aid and the dough hook), form the dough into a ball and place it in a greased bowl to rise. I turn it over once in the greased bowl so that the top gets greased (so as to not dry out). 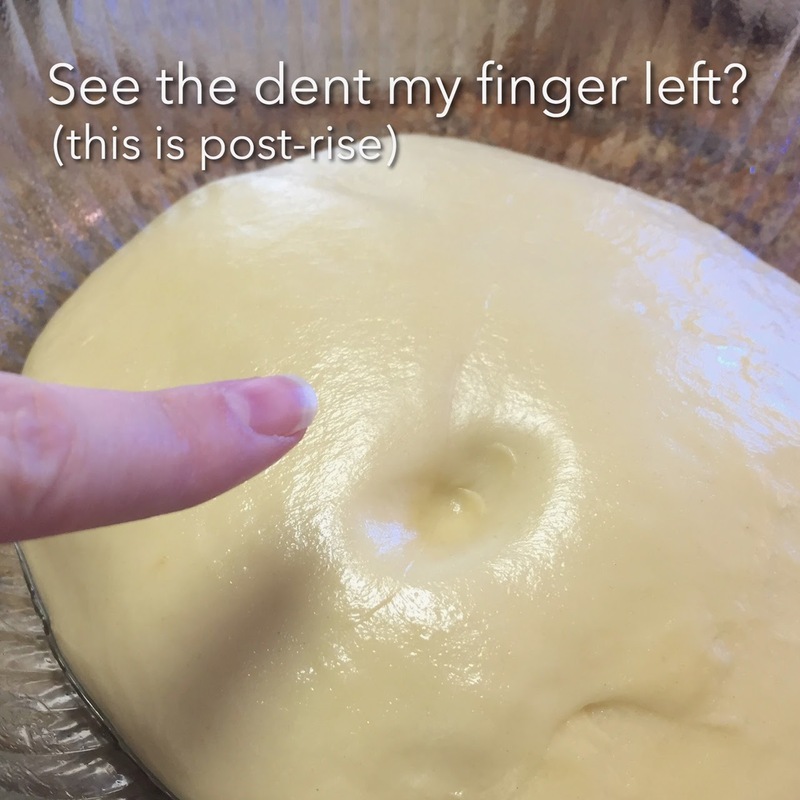 Then place a clean dish towel (I get it a little damp--once again so the dough doesn't dry out) over the top of it and let it rise until puffy, and when you press your finger in it, it leaves a little dent (meaning it doesn't spring back). The timing of this depends on the temperature of your kitchen. It can take an hour or longer. However, I don't like waiting. So when I start making the dough, I turn my oven on for exactly one minute and thirty seconds, and then turn it off once my timer goes off. That will get my oven nice and warm (but not too warm) to aid in the yeast tooting...er, I mean the dough rising. Then I place the damp dish towel on top of the bowl and place it directly in the warm oven. It usually takes about 30-40 minutes for the dough to rise enough (almost doubled in size). After the first rise, the dough is ready to be rolled out. Almost. Spread a little flour on your work surface. Then dump your dough out. I pat it down into a rectangle. Then I cover it with the towel again to allow it to rest for ten minutes (so the gluten strands will loosen up a bit again) so it will roll out nicely for me later. 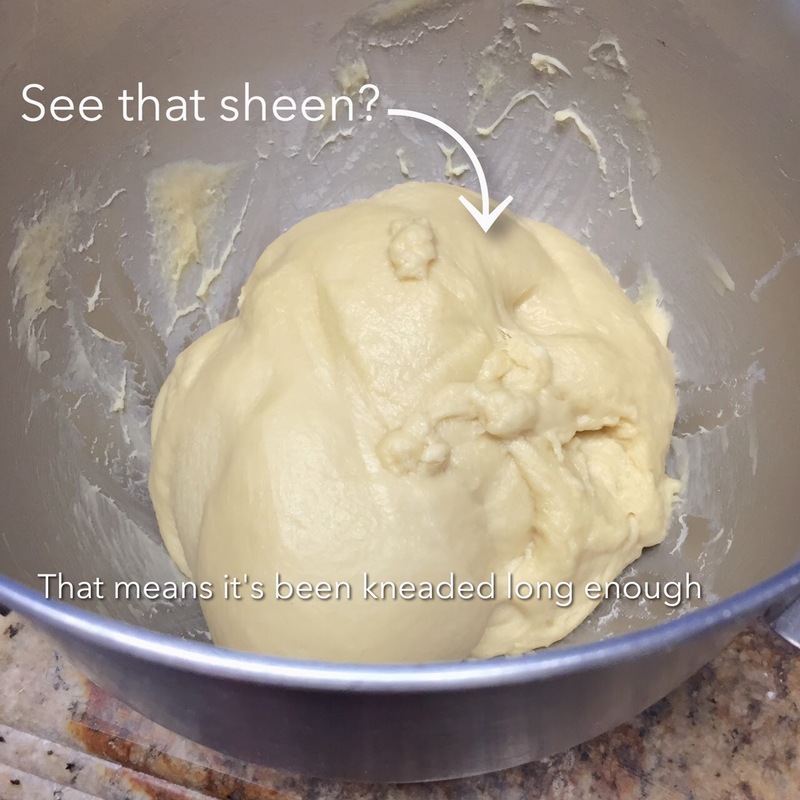 Every time you man-handle the dough, the gluten strands will get super springy again, and if I tried to roll it out right away, it wouldn't hold it's shape, and would spring back a bit. So waiting for a few minutes is a good thing. Now what to do while you wait ten minutes....Make the fillings! There is a cream cheese filling and a cinnamon-brown sugar filling. I start with the cream cheese filling. 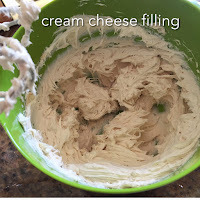 Ideally, your cream cheese will have been sitting out to soften for a little while. But it's not a huge deal if you forget to set it out. Mix the cream cheese and sugar together with a hand mixer until very smooth. Then add the vanilla and mix it until all combined. Set it aside. 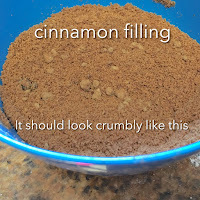 In a separate bowl combine the ingredients for the cinnamon filling. It will look crumbly when it's mixed. Ok, now let's assemble our cinnamon roll loaf! 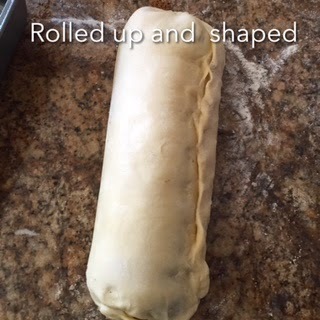 Roll out the rectangle of dough to around 9 inches x 20 inches. The dough will be a little thicker than 1/4 inch when rolled to this size. Now spread the cream cheese filling over the dough. Leave a couple of inches uncovered on the end of the rolled out dough (to be able to seal the loaf after we roll it). Then sprinkle the cinnamon filling on top of the cream cheese mixture and pat it down. Now starting from the end where the filling goes to the edge, begin to roll it up! Then seal it, seal the ends of the loaf, and place it seam-side down in a greased loaf pan. Cover it with a dish towel and allow to rise until the top of the loaf is about 1/2 inch to an inch above the rim of the loaf pan (about a half hour). And now the hard part is all done. Yay. Once the loaf has risen, preheat your oven to 325 degrees Fahrenheit, with the rack in the lower third portion of your oven. Once it is pre-heated, place the loaf on the rack in the oven and bake for 55-65 minutes. You don't want to under-bake this as it will be doughy in the middle. The top of the loaf will get fairly brown, but having the loaf in the lower third of the oven will help it not get over-browned. Then allow the loaf to cool on a rack (if you can wait!) and enjoy!!!! 1. Add the warmed milk, melted butter and sugar in the bowl of a stand mixer. Sprinkle the yeast in and mix. If using instant yeast, you may progress with the rest of the instructions. If using active dry yeast, allow mixture to sit for about 10 minutes until it develops a frothy foam on top. Then you can proceed. 2. Add the egg, 1 ½ cups of the flour, and salt to the bowl. Using the paddle attachment, mix on medium speed until the mixture is smooth, about 30 seconds. Remove the paddle attachment and attach the dough hook. 3. With the mixer on low speed (1-2 on a Kitchen-Aid), add enough flour until the dough comes together and is not too sticky. I usually use a total of 2 ¾ cups of bread flour. Continue machine kneading (with the mixer on a 2 if using Kitchen-Aid) for 4-6 minutes and dough is satiny smooth and has a sheen. 4. 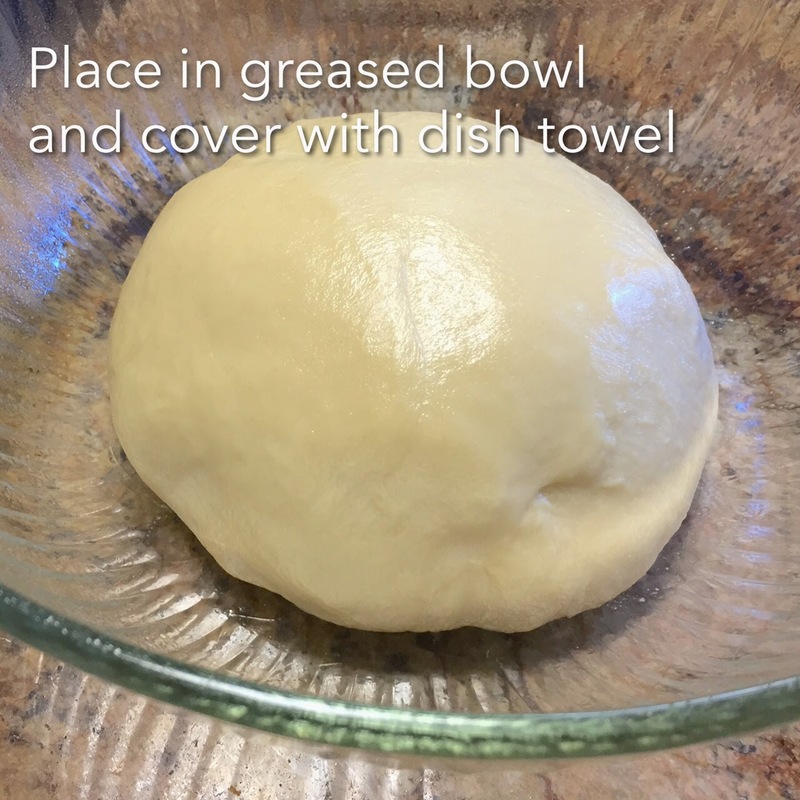 Form dough into a ball and place in a greased bowl, turning it once in the bowl to coat the top in the oil. Cover the dough with a dish towel, place in a warm place, and allow to rise until almost doubled (about an hour or so). 5. Once dough has risen and the imprint of your finger stays when you push on the dough, dump it out on a lightly floured work surface. Shape into a rectangle and pat down. Cover with the dish towel and allow dough to rest for 10 minutes. 6. 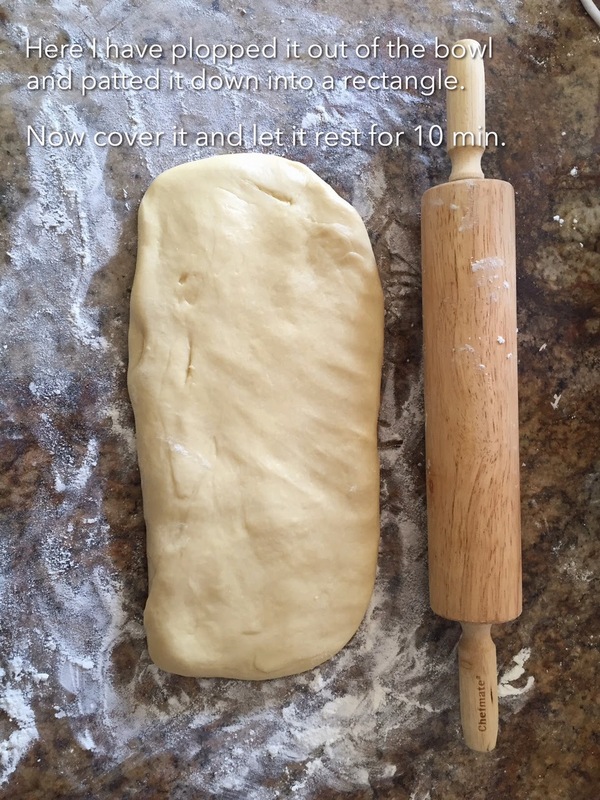 After resting, roll the dough out into a rectangle roughly the size of 9 inches x 20 inches. 7. Spread the cream cheese filling over the rectangle, making sure you get it spread to the edge of the two long sides and one of the short sides. Leave a 2-3 inch strip on the other short side that is uncovered. 8. 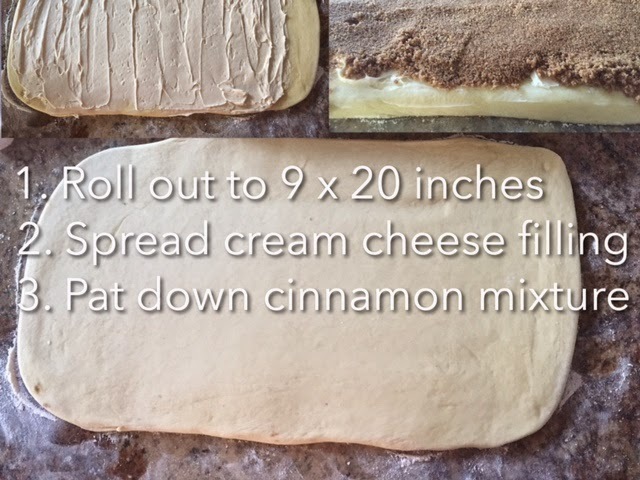 Sprinkle the cinnamon filling over the cream cheese filling and pat it down. 9. Roll up the dough starting from the short side that is covered by filling. 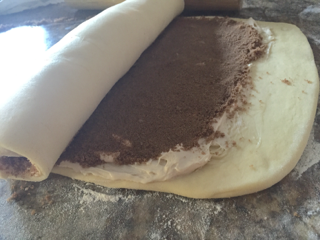 Roll all the way up until you get to the unfilled section of dough. Lift the unfilled section up and seal the dough by crimping it with your fingers. Crimp the ends of the loaf together as well. 10. 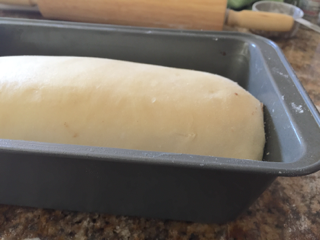 Turn loaf over so the seam-side is down, and place in a greased bread loaf pan. Cover and allow to rise until it is about ½ inch over the rim of the pan, about a half hour. 11. Adjust oven rack so that the loaf will rest in the lower third of the oven. Pre-heat the oven to 325° F. Bake loaf for 50-65 minutes, or until top is fairly browned, and the top of the loaf sounds hollow when you knock on it (and doesn’t squish). It is normal for the top layer of dough to separate some from the first layer of filling. 12. Remove bread from oven and place on rack. Allow to cool for fifteen minutes. Remove loaf from pan and place on the rack to completely cool (if you can wait that long!) before slicing. 1. Mix the cream cheese and sugar together with hand mixer until smooth. Add the vanilla and mix until combined. 1. Combine all ingredients and mix using a hand mixer. The mixture will be crumbly. I hope you enjoy this as much as my family does! Hello. My name is Kim and I love to bake and craft (mostly making children's soft toys). I am a Registered Dietitian, and so have a passion for nutrition as well, but spend most of my time and find most of my joy in being a wife and mother.